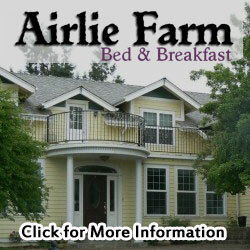 Airlie Farm is located on 226 spectacular, scenic acres in Oregon's Willamette Valley beautiful horse and farm country. Rolling hills and lovely peaceful views surround this old fashioned Inn. Owners Nancy and Joe Petterson have created a beautiful farm that is also a Bed and Breakfast Inn. This working Quarter Horse Farm is nestled in the heart of Willamette Valley Wine Country. The inn is the perfect overnight or vacation getaway. We have been breeding and raising champion Quarter Horses for over 50 years. View our horses for sale on our Horse Sales Page. The pedigree of our horses have working in mind, along with temperament and athletic ability. Looking for an outstanding stallion? Check out our Outstanding Cutting Horse Champion, "CDS High Five". His specialty has been cutting. Anyone wanting to put truly great working horses in their next foal regardless of the discipline need to seriously take a look at this handsome well muscled guy.